As we head into Thanksgiving, Mtbr brings you a pair of stories under the banner “Giving Thanks” that detail personal stories of adversity and redemption through cycling. We hope they serve as a reminder of how lucky we all are to be part of this amazing sporting community. At that moment, lying in a muddy Wisconsin snow bank with her foot mangled and facing the wrong way, one would understand if pro cyclocross racer Cassie Maximenko called it a career. But Maximenko wasn’t thinking about quitting—she was actually already on the comeback. Turns out, that’s kind of her thing. Bike racers are a different breed—that much goes without saying. Despite the mental and physical hardships present in racing, there’s something that keeps riders showing up to the start line and clipping in for what basically amounts to a crapshoot. That’s just the reality—in a race, anything can happen. At the end of it all, cyclists are still human. And humans crack. It’s what happens afterwards that defines them. Defines us. Connecticut cyclocrosser Cassie Maximenko is a prime example of what it means to defy the odds, lose something and find redemption. Overcoming, it would seem, is part of her DNA. She learned to appreciate simple pleasures from a young age, and there’s no simple pleasure more analogous than cycling. At the tender age of 17, Maximenko got a huge helping of that pleasure, embarking on a ride across America during summer break. You know, typical high school shenanigans. Maximenko fueled her drive for adventure in other ways too—she ran track, rode a motorcycle, and competed in sprint triathlons, all while studying athletic training at Sacred Heart University in Fairfield, Conn., near where she grew up. Along with the adventure came adversity, both physical and otherwise. Breaking her collarbone riding was one thing, but enduring an abusive relationship was quite another—one she prefers not to talk about. None of it, however, dissuaded her from riding for very long—it remained her simple pleasure. Characteristically, Maximenko dusted off the bad relationship and started dating “the cute guy from the bike shop”—a triathlete and ‘cross rider named Mike. Given her previous relationship Cassie wanted to take things slow, and Mike was both amenable and kind about it. After completing her undergrad, she moved to Mesa, Ariz. to work on her master’s degree and continued to race triathlons, now tackling bigger ones and getting faster. She finished the SOMA Half-Ironman raising $3,500 for charity while she was at it. Things were definitely on the upswing. The cute boy from the bike shop became her fiancé, and she moved back to Connecticut after grad school. Since two degrees weren’t enough, she added a Doctor of Chiropractic degree to her resume as well. With copious academic achievements, along with increasingly impressive athletic results, it’s clear Cassie is ambitious and energetic—the quintessential “if you put your mind to it you can achieve anything” type. But her now-husband Mike soon introduced her to something she really wasn’t sure she wanted to put her mind to—cyclocross. She drew a line and stuck with it. For a while. In 2009 Maximenko jumped in head first and by the next year found herself racing in the pro women’s UCI class—the real deal. Most people thrown into this situation would find themselves flailing in the back, hoping not to get lapped. Cassie, however, is not most people. In her first season in the “bigs,” she scored a number of top five finishes and even podiumed once. Within a year Maximenko went from first-timer to the UCI Elite class. That’s what you call progress. The results kept coming and by 2012, a top-10 finish at Cyclocross Nationals was not only a realistic goal, but almost expected. Riding on the East Coast had prepared Maximenko for poor weather conditions, but Mother Nature had a lesson in store for the competitors in Madison, Wis. that weekend. Blowing snow, icy patches and temperatures barely into the 20s made for brutal and treacherous racing conditions. Halfway into the first lap, Cassie’s wheel slipped out in a corner and she put down her right foot to brace the fall. Within milliseconds, she hit the ground. Her first reaction was to get up but she just couldn’t. 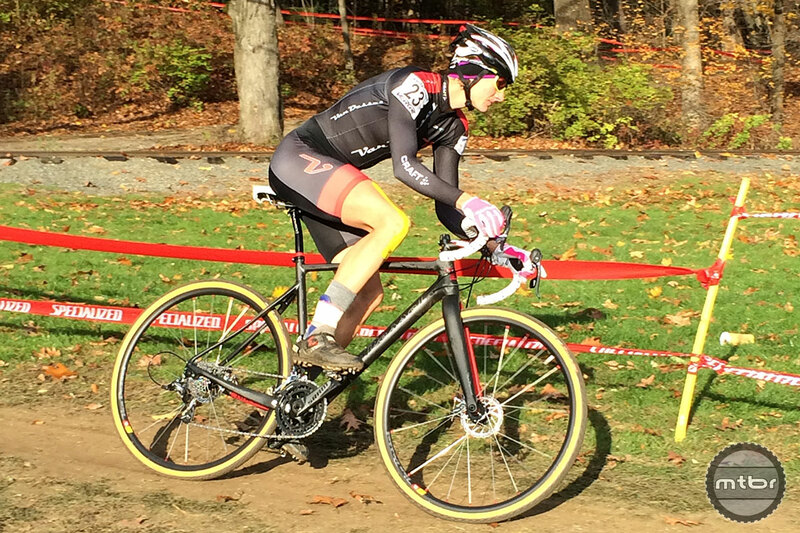 Maximenko went to ‘cross nationals in 2013 hoping for some hardware. This is not what she had in mind. As spectators helped pull her out of the racing line, Maximenko immediately knew the road recovery was going to be a long one. And even before the medics arrived she was already on it. A trip to UW Hospital and surgery followed. 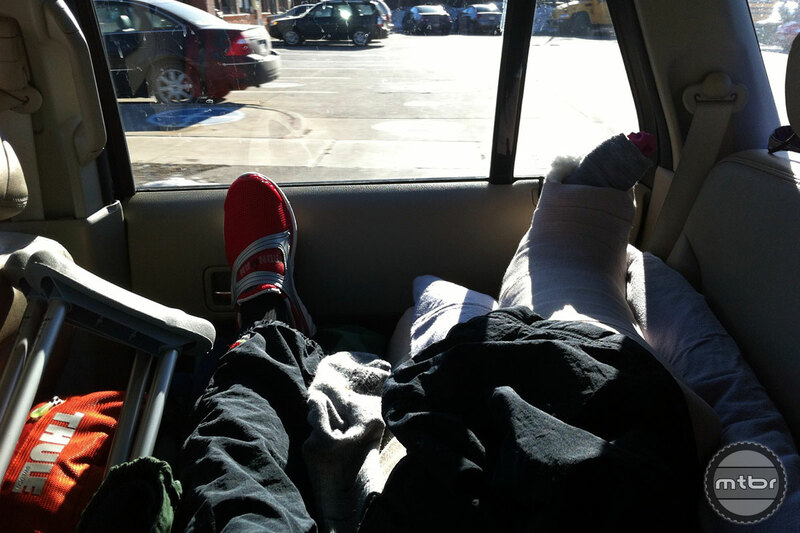 Four screws in her ankle later, Cassie rode along as her support crew made the long, quiet drive back to Connecticut. 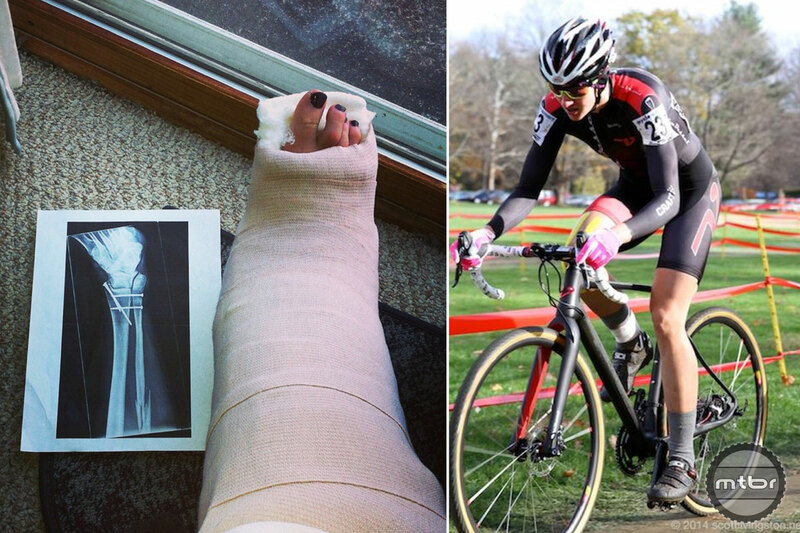 The ride home from Wisconsin to Connecticut was not a fun one after Maximenko mangled her foot at Cyclocross Nationals. 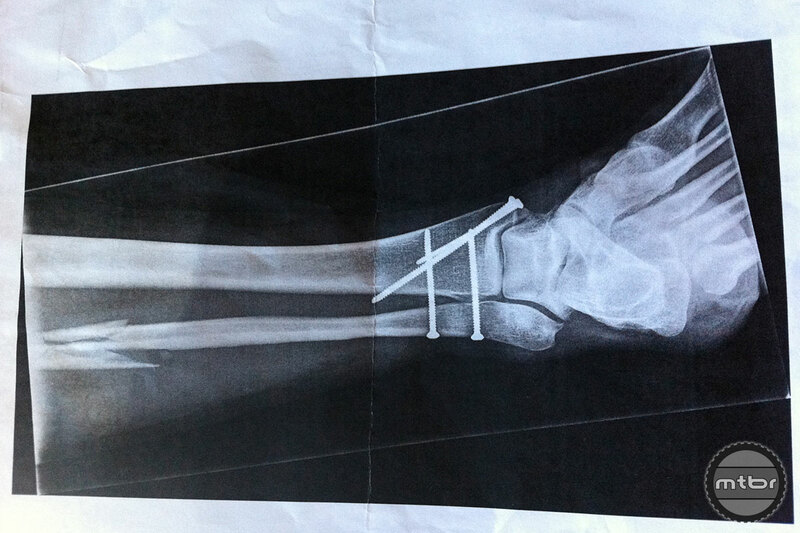 Maximenko spent the next 13 weeks unable to bear weight on her foot. Quite the 180 for someone who only a few months prior was eyeing a top finish at nationals. Come spring, Cassie could ride a trainer for 15 minutes at a time–anything more and the “swelling became unbearable.” In May, the screws were removed from Cassie’s ankle, and by June, with the assistance of an air cast, she was able to log miles outside. Despite only being able to sustain 15 minutes on a trainer, Maximenko maintained a positive attitude through her long rehab. With ‘cross season just two months away, it would be easy for Cassie to look past it. To accept the inevitable that comes with severe injuries. After all, missing one season in the big picture could be fairly inconsequential especially for someone whose ankle had essentially been blown to smithereens. But that’s not our girl. While 2013 was a rebuilding year for Maximenko, her progress was evident—the improvement as both her strength and confidence improved from one race to the next. Her body healed and her mind eased. For 2014 Cassie took her act on the road—literally. 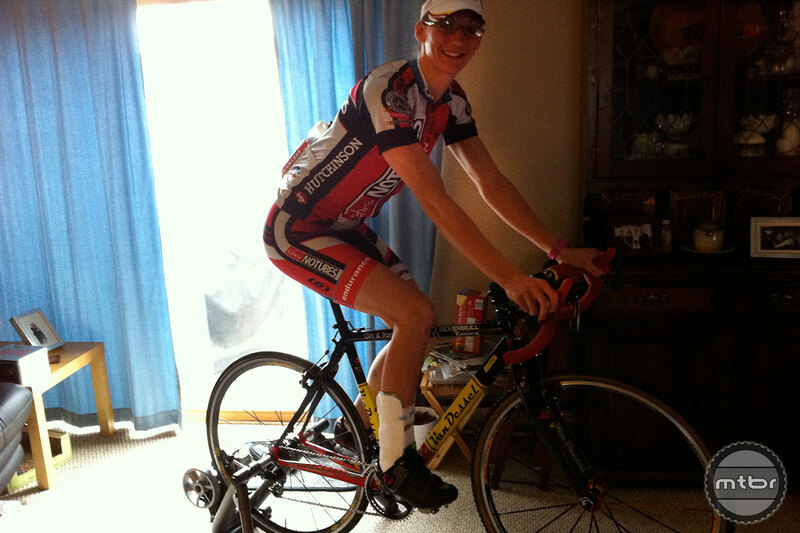 She joined the Stan’s NoTubes/Endurance Werx road team and earned an upgrade from Cat 4 to Cat 2 in just four months. With two wins and a top-10 finish at Cross Vegas already, Maximenko is on track for a strong 2014 ‘cross season. That road-earned fitness has carried over into ‘cross season with Maximenko taking wins at the HPXC UCI race in New Jersey and the Cycle-Smart International Cyclocross Race in Massachusetts. She also finished 10th in a stacked field at Cross Vegas in September. Come January, Maximenko will face her nemesis Cyclocross Nationals in Austin, Texas. Win, lose or draw, one thing is for certain—in the race for redemption Cassie Makimenko is already on the top step of the podium. In addition to her husband Mike’s unconditional support, Maximenko is thankful for her sponsors who’ve stuck with her through thick and thin. Rare Vos Racing, Van Dessel, PowerBar, Smith Optics, and Horst Engineering Toe Spikes have continued to support her despite a rough 2013. This year she added ISM saddles to an already strong sponsor lineup. 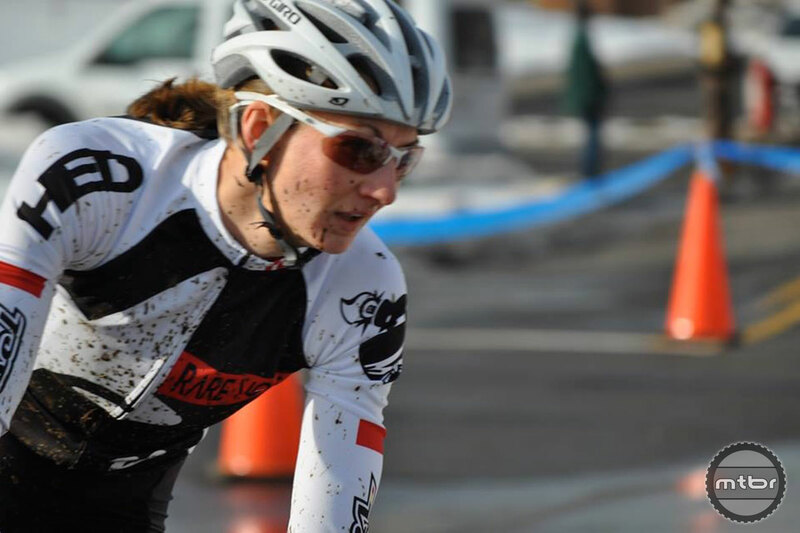 Cross racer Cassie Maximenko went to ‘cross nationals in 2013 hoping for some hardware. This is not what she had in mind. Colorado-native Addie Levinsky knows there was a time before cycling, but she doesn't want to think about it. She started pounding pavement five years ago and after discovering the inexplicable joy of singletrack, she strives to elevate adventure on two-wheels. While maintaing her life-long passion for writing, and earning a degree in philosophy, there seemed to be no better fit than contemplating the meaning of life, outdoors, on a bike. And attempting to put it all into words. Without being too Thoreau-ish. It is awesome to hear a story of recovery from an injury such as Cassie’s. I broke my ankle in 3 places in August 2014, after a surgery, 13 screws and a plate installed, physical therapy and a removal of 2 screws, I’m hoping to be able to get back on a mountain bike in the spring. I have already spent trime on a bike in a trainer, and pedaling again felt awesome – I’ve lost a lot of myscle mass, but it’s coming back. In fact it feels like biking right now is easier for me than walking. Seeing stories of people with similar injuries to mine, successfully coming back to the sport and doing so competitively is truly inspirational for me, and I am thankful that you have chosed to share your story Cassie at this special time!